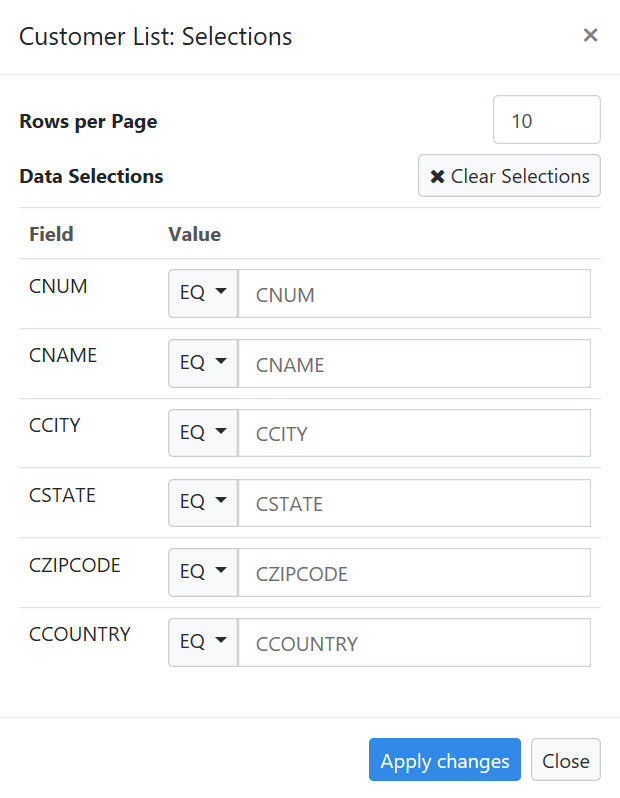 In templates that support a list view (Multiple Row Data List, Display and Maintain Rows, Grid Update), developers have a few configuration options for how they would like their users at run-time to search and filter application data. When building an application, these options are listed in the Application Settings tab, particularly at the very bottom of the screen under the Compile Options section. Specifically, this post will focus on the “Advanced Search” property and its available options. 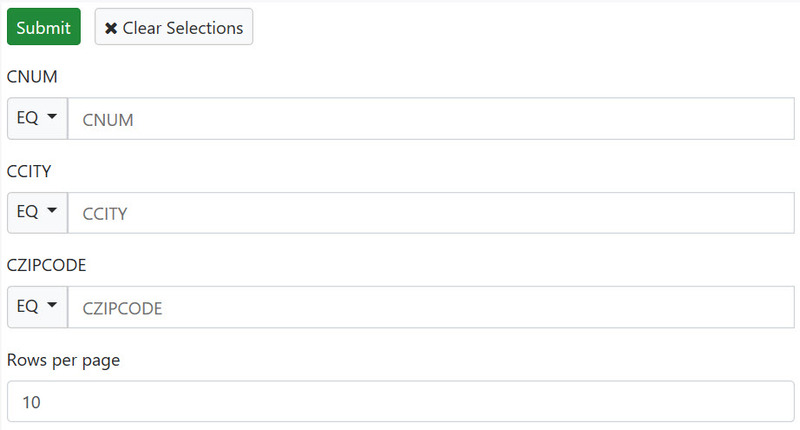 The Advanced Search Row option adds search/filter inputs directly atop each of the application’s columns. For larger applications with many fields (columns), this option is likely not as ideal if users will need to filter on many columns that may be initially off-screen. When selected, this option will display the search/filter inputs in an expandable section directly above the application data table. Pressing the ‘Selections’ button serves to expand or collapse the section from view. As this option takes up some of the available screen real estate directly by ‘pushing down’ the application table, this option is also recommended in applications with less rather than more filters to display. By default, the Filters Above Table option will be hidden from view when the application is loaded. However this may be changed to have the filters display automatically on page load in the Application Properties (Program Options->Display Top Filters on Page Load). Changing the Advanced Search option at any point in your existing application requires you to recompile and overwrite the HTML layer in your application. Note that when creating a new application and are in the Application Settings screen for the first time to select a template, the Compile Options section at the bottom of the screen will not be available until you leave this screen to continue the build process. Once you leave this Application Settings screen, you may come back and now the Compile Options will appear at the very bottom of the screen. Try the m-Power Development Platform. Create enterprise web applications without programming.